2014 was a great year for us and our clients, with lots of exciting projects. So, we thought we’d take a look back at the highlights of 2014. This year we teamed up with Park Resorts and their media agency Navigate Digital to help Park Resorts customers create even more amazing memories. With over 41 different holiday parks in the UK, we needed to boost engagement through all sorts of digital channels. We started with targeted online display to advertise their great holiday rates. As our relationship with the Park Resorts team grew, we had the opportunity to get creative with their Amazing Memory map, which let Park Resorts guests upload and share their favourite holiday memories. This was such a success that we’ve since added seasonal twists to the map, starting with Halloween. Of course, Christmas is also big news for Park Resorts. We love a bit of social, so we were pleased to be involved in creating their most successful social campaign to date – the Park Resorts Gift Tagathon. This let their Facebook fans tag themselves in our weekly posts to win some fantastic prizes, all supported by targeted email marketing of course. A Merry Park Resorts Christmas was had by all! Read more about our work with Park resorts here. Yes, that’s right – we launched our new website in 2014! It was a long time in the making, but after a huge effort from the whole Rawww team we now have a website we’re very proud of. 2014 also saw the introduction of Good Stuff – our way of putting what we do into words, communicating everything from great digital marketing, design, and development, to social, copywriting, and print design. We put this all into our about us video, a project in itself – take a look at the finished article here. Christmas 2014 was the year of the Penguins. NCP’s partnership with the new Penguins of Madagascar film meant we had plenty of colourful characters to feature in their Christmas campaign. We helped to craft a fun campaign to run across NCP’s 500+ car parks during their hectic festive period, including all sorts of posters, banners, Christmas cards, digital assets, and even more. It was great to see the Penguins posters at NCP car parks over the Christmas period – after lots of hard work to get them finished, they still brought a smile to our faces! Meet the Penguins on our blog here. 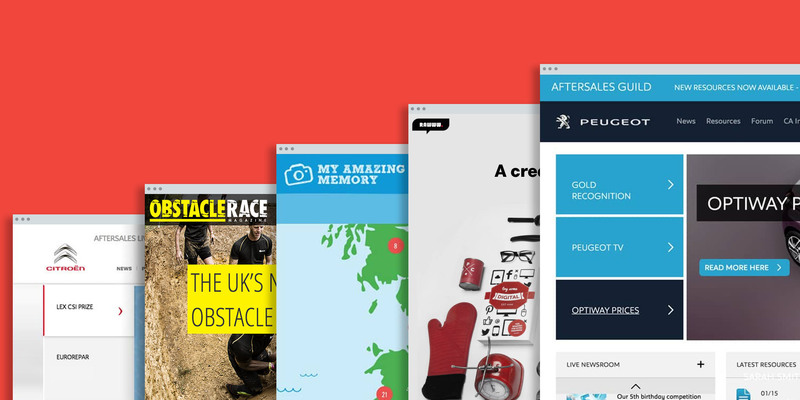 We’ve been working with the Obstacle Race team for over a year now, and it’s been great to see the magazine grow and develop over this time. It’s been an eye opening experience to be with the magazine from the start, working with the editorial team to create a brand experience that people enjoy reading and contributing to. With an active social following and their very own event coming up in August – the Mudnificent 7 – things look set to grow even further for Obstacle Race Magazine. We like to think we know our way around the obstacle racing scene now – at least, in theory! Twist our arms a bit and you might see Team Rawww out on an obstacle course in 2015… Look out for issue number 7, coming very soon – complete with a whole new look for the new year. Read more about Obstacle Race Magazine here. It was a big year for both Citroen Aftersales Live and the Peugeot Guild. 2014 was the first full year of Citroen Aftersales Live, and we celebrated its first birthday in October. We’ve enjoyed creating this engaging communications platform for Citroen dealerships across the UK, sharing the latest news and competitions with them. Particular successes include our Christmas competition, with a record number of entries, as well as our quizzes to get Customer Advisors thinking about their customer service. After a refresh at the end of 2013, the Peugeot Guild has also gone from strength to strength and celebrated its 5th birthday in January this year. We can’t wait to show Peugeot’s Customer Advisors what’s next, especially with lots of exciting updates already planned for this year. Above all, we’ve enjoyed working with both the Citroen and Peugeot teams – here’s to a great 2015 together! We worked with the team at Wateraid to put together their online digital brand guidelines, helping to create consistency for the brand. From online display banners, website design, and email marketing, we covered fonts, colours, photography usages, and more. This has helped to build the brand at all levels, and has made sure everything has that distinctive Wateraid personality – especially when working with external agencies. This was a rewarding project, and we’re glad to see these style guidelines being implemented by the Wateraid team across their online presence. So, all in all, 2014 was an exciting year – but what’s coming up in 2015? We already have a few exciting projects on the go, but you’ll have to wait to hear all about them… watch this space!